#9. 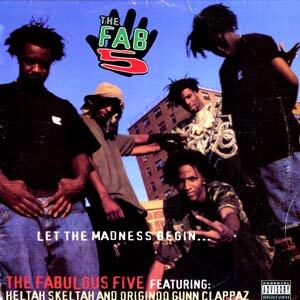 Fab 5 "Leflaur Leflah Eshkoshka"
Like the "Electric Relaxation" hook and half of ODB's recorded output, this track's title is hip-hop gibberish at its finest. The 12" sleeve defines "Eshkoshka" as a Bootcampian war cry that translates to "fabulous," though it's unclear how that definition came to be or why they wouldn't just say the word fabulous. Whatever the case, it's a strong early outing from the BCC's second-stringers (OGC and Heltah Skeltah) performing in tandem as the Fab 5.